There are others like this floating around, but I figured I'd share my 'gapless' double tracks from the GB map. There is a range of speeds (I'm afraid the icons list miles per hour, not kph, but mouseovering gives the kph value for those unsure). 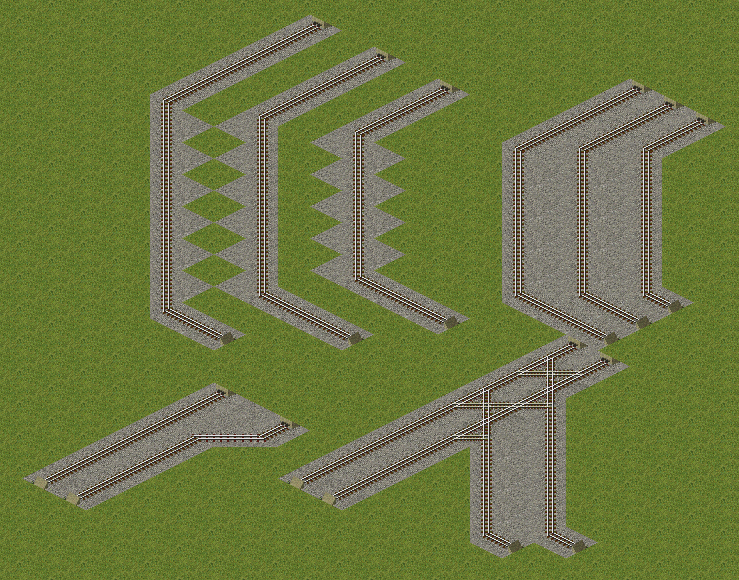 For each speed you get three tracks -- a 'left' a 'right', and a 'centre' (which can be used for situations with more than two tracks. There is also a city building which serves as an empty texture square for use in complex junctions etc (you can see this in the bottom left). I wonder if the "magic" used for multitrack tunnels and platforms could be used for this as well. It would save having to switch between the three manually, but it would still require a separate "don't merge" track type if people want parallel tracks with gaps. Speed details regardin max. Speed please. It's certainly something on the list of things I want to add at some point. That would be a very worthwhile thing: Carl's map does look good with this. Who this rail's are cool. Carl it's possible that's after all new modells they you have be make to Update The PNG and Dats repository? It heavy sometime too keep a overwiew over your Modells. Well I'm trying to stabilise the new bridge code (and draw graphics for all the bridges in pak128.Britain to work with this). Once that's done I can think about the next thing!